Editor’s Note: Roger Conrad and Elliott Gue will share their expertise with investors at the upcoming World MoneyShow Toronto, which will take place Oct. 16 to Oct. 18 at the Metro Toronto Convention Center. Roger will give a presentation on one of his favorite themes for income investors. Registration for this must-attend conference is free. Sign up at MoneyShow.com or call 1-800-970-4355 and tell them that Roger Conrad and Elliott Gue sent you. Five-and-a-half years into the current bull market, the Bloomberg North American REIT Index has yet to recover to its pre-2008 high, reflecting the absolute shellacking that rents and property values took during the worst financial crisis since the Great Depression. Many US real estate investment trusts (REIT) also have yet to restore their dividends to the levels that prevailed before the meltdown. Mall owner Kimco Realty Corp (NYSE: KIM), for example, pays a quarterly dividend of $0.225 per share—significantly lower from the $0.44 per share that investors received in April 2009. Nevertheless, the current payout is considerably higher than the $0.06 per share that the REIT disbursed after slashing its dividend by 86 percent in 2009. Prologis (NYSE: PLD), a REIT that owns industrial logistics assets around the world, omitted its dividend in late 2008 and still pays shareholders a third less than before things fell apart. And Vornado Realty Trust (NYSE: VNO), a leader in office properties, cut its quarterly dividend to $0.37 per share plus stock from $0.914 per share in cash. The REIT now disburses $0.73 per share to investors. Although these dividend cuts were painful for investors who depend on these quarterly payouts for income, it could have been worse: Many mortgage REITs, for instance, didn’t survive the financial crisis and Great Recession. That being said, some US REITs emerged even stronger from this stress test. Simon Property Group (NYSE: SPG), for example, has grown its revenue almost 50 percent since 2008 by making canny acquisitions from distressed sellers. The owner of malls, outlet centers and lifestyle spaces pays a quarterly dividend of $1.30 per share, compared to $0.86 per share prior to the crash. Nevertheless, US REITs trade at historically lofty valuations; the average stock in the Bloomberg North American REIT Index, a basket of US-listed trusts, trades at more than 10 times sales and 2.4 times the equity value of the underlying properties. 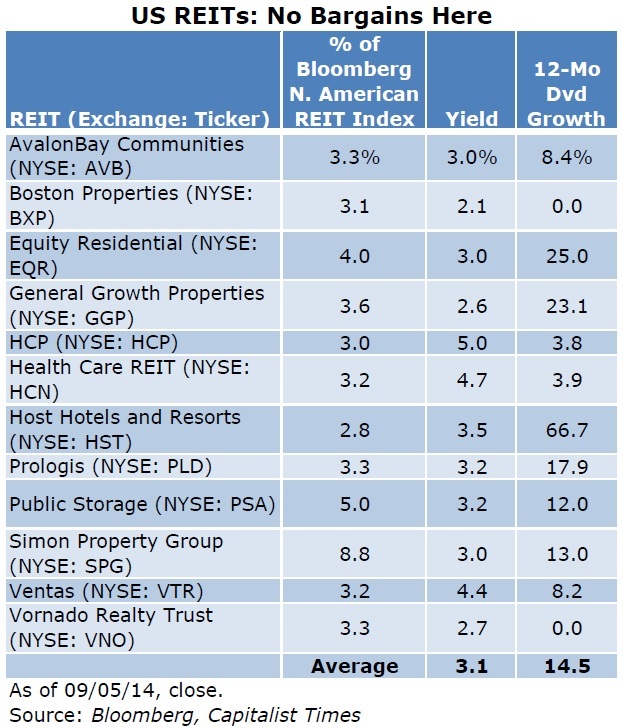 And this basket of US-listed REITs offers investors a current return of 3.5 percent—well below the 4 percent yield that the index sported when it climbed to its all-time high in February 2007. 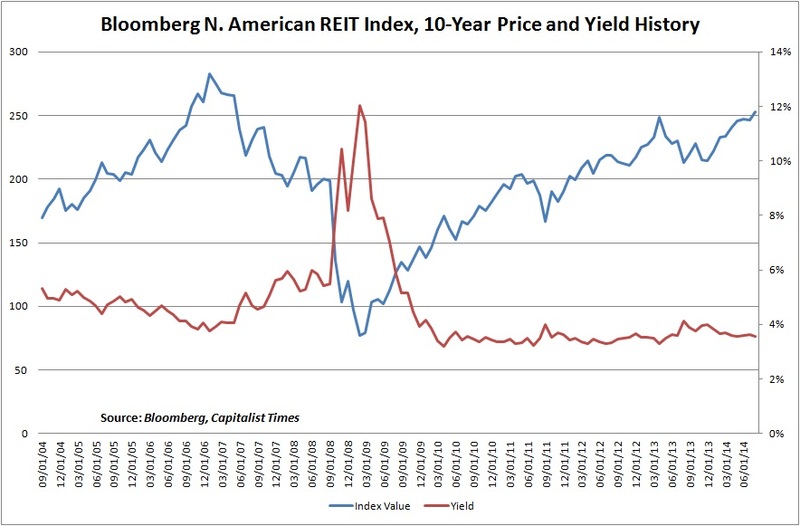 Why are investors paying so much for US REITs? 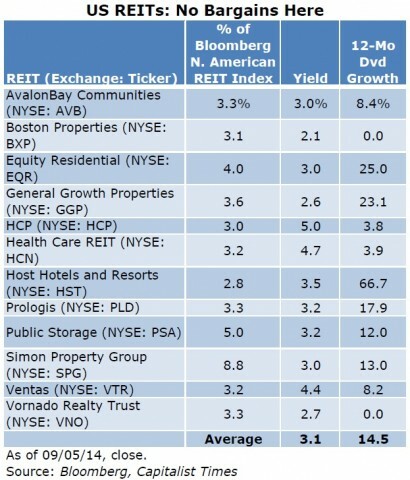 Their recent history of robust dividend growth is one likely reason; the Bloomberg North American REIT Index’s 12 largest members have raised their payouts by an average of 15.2 percent over the past year. By comparison, the Dow Jones Utilities Average’s 15 constituents have increased their dividend by an average of 6.4 percent over the past 12 months, while the 12 largest master limited partnerships (MLP) in the Alerian MLP Index have grown their distributions by 7.2 percent. But appearances can be deceiving. No utility in the Dow Jones Utilities Average cut its dividend between 2007 and 2009. In fact, almost all the names in this index raised their payouts at least once during this trying period. The 50-member Alerian MLP Index posted a similar track record. In stark contrast, the 12 large-cap REITs in our table—these names account for about half the Bloomberg North American REIT Index—are still playing catch-up after taking their licks during the financial crisis. Host Hotels & Resorts (NYSE: HST), for example, has grown its payout by 66.7 percent over the past 12 months, finally approximating its quarterly dividend from October 2008. Can US REITs sustain this rate of dividend growth? If the answer is yes, there’s some justification for US REITs’ record multiples; if not, expect the space to suffer a valuation reset. In the case of Host Hotels and Resorts, the REIT grew its second-quarter revenue 2.3 percent from year-ago levels, but its adjusted cash flow tumbled 4.6 percent. Although the company boasts a relatively low payout ratio of 46.5 percent, the cyclical nature of the upscale hospitality industry requires a cushion to ensure the dividend’s safety. Bottom Line: Host Hotels and Resorts’ 3.5 percent yield looks low, while the stock’s multiple of 2.33 times book value appears unsustainably lofty. Overvaluation appears to be even more of an issue for Vornado Realty Trust and Boston Properties (NYSE: BXP), both of which specialize in office spaces. These stocks yield less than 3 percent and trade at more than 3 times book value, though neither REIT has raised its dividend since the first quarter of last year. And in both instances, management has warned of a challenging operating environment. Even more alarming, the dozen US REITs on our list are some of the industry’s largest and have navigated a difficult business landscape better than their peers. These names have achieved scale that provides a degree of insulation against any future headwinds. 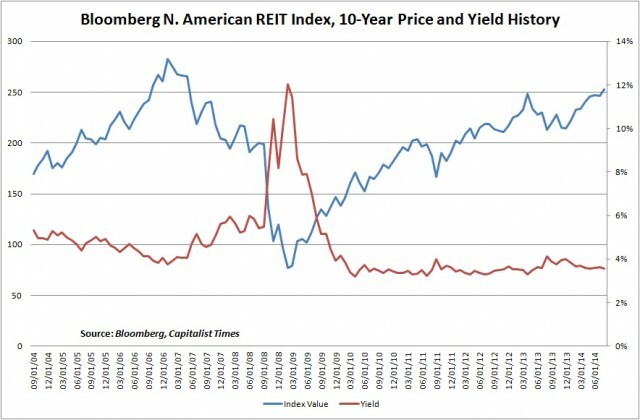 US REITs look like increasingly dangerous investments. And unlike utilities and master limited partnerships, real estate investment trusts have exhibited a discernible correlation between their total returns and fluctuations in interest rates. With valuations this high, investors could feel the pain as the Federal Reserve gradually raises interest rates or the market panics in anticipation of higher borrowing costs. Fortunately, Canadian REITs trade at reasonable valuations, offer superior yields and generally operate more conservatively than their US peers. But with so many US REITs to choose from, few American investors bother to consider Toronto-listed names. Cross-border investing also has its complexities. For example, the Canadian government assesses a 15 percent withholding tax on stocks held in taxable accounts; US investors can reclaim this assessment as a tax credit by filing a Form 1116. Many investors regard this complication as one hurdle too many. And many individual investors use brokers that refuse to trade foreign-listed stocks or charge exorbitant fees to do so. Fortunately, Everbank, Interactive Brokers and a host of other outfits give American investors plenty of options for trading shares listed on international exchanges. The upcoming issue of Capitalist Times Premium will feature my in-depth article on Canadian REITs, which offer an average yield of almost 6 percent; even if you make no effort to reclaim the 15 percent withholding tax, these names offer a significantly higher yield than Bloomberg North American REIT Index. The Canadian REITs that I cover also trade at an average of 1.06 times book value. In other words, investors can buy these high-quality REITs for roughly the value of the equity in their underlying properties. One name we follow trades at 0.74 times its book value, a rock-bottom valuation that reflects a low bar of expectations that the REIT should be able to beat—a proven recipe for price appreciation. These low valuations are also an open invitation for takeover offers. In recent years, several big deals in the REIT space have handed investors windfall profits. Many of the Canadian REITs that I highlight in my upcoming article would be small mouthfuls for the industry’s heavyweights. Why have Canadian REITs lagged their US counterparts? Most haven’t raised their dividends over the past 12 months, while those that hiked their payouts did so modestly. By and large, Canadian REITs continue to de-risk their portfolios and balance sheets, signing high-quality tenants to long-term leases, paying down debt and swapping out less appealing properties. Accordingly, most Canadian REITs should be able to preserve their dividends. However, growth rates pale in comparison to their US counterparts—a turnoff that has weighed on investors’ total returns this year. But the sector’s combination of high yields, low prices, little support from analysts and limited downside risk should be of keen interest to anyone seeking value in this aging bull market. Insiders appear to agree. The directors and executives of our undervalued, contrarian pick have increased their holdings by almost 56 percent over the past six months. Meanwhile, insiders in RioCan Real Estate Investment Trust (TSX: REI-U, OTC: RIOCF)—Canada’s largest REIT by market capitalization—have increased their holdings by a whopping 76.3 percent over this period. What do these insiders see that the market has missed? I’m betting on improving cash flow and an eventual return to dividend growth. And even if conditions in Canada’s property market remain challenging, low valuations, strong balance sheets and high-quality portfolios should ensure the safety of these REITs’ generous dividends. In other words, Canadian REITs are a compelling value proposition for income investors of all stripes, including those who have never purchased a real estate investment trust on either side of the border. Check out the upcoming issue of Capitalist Times Premium for our favorites to buy now. Not a subscriber? Sign up for a risk-free trial of Capitalist Times Premium today and save $70 on an annual subscription.